Sample of business letter and personal application letter formats in word file. Download .doc/docx/xls/pdf file example. It is my honor to write this letter of recommendation on behalf of Ronal Golgario for an internship with your organization. I had Ronal in my student of the Bachelor of Business Administration (BBA or B.B.A.) / the Master of Business Administration (MBA or M.B.A.) course and found his to be a cheerful and motivated student. He has held a part time job while a student at SUB and at the same time has successfully completed her coursework, receiving CGPA 4.53 out of 5. One of Ronal's primary strengths is her independence and ability to be a self-starter. As an intern, he would eagerly learn from his mentors, while applying his communication skills in his position. I believe Ronal has the capacity and skills to perform well as an intern and hope that you will give her the greatest consideration when making your hiring decision. Please feel free to contact me if you would like to further discuss about Ronal's. 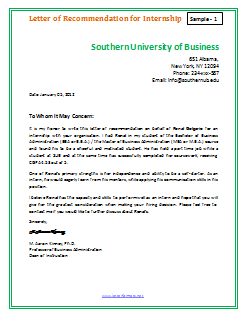 This letter is written on behalf of Emon Rosario for an internship. I have known Emon since he was a student in my course in Computer Science & Technology. He distinguished himself in my course by receiving CGPA-5 grade in the class. Emon is the type of person who loves learning. He's one of those rare people who works very hard and diligently, but does so with a smile on his face. Emon is a dedicated student who not only studies and receives excellent grades, but also tutors and assists professors and students at the Academic Technical Learning Center. I have taught at the University level for fourteen years and have found few students who are as determined and dedicated to reaching their goal as is Emon. He has been active in program designing, troubleshooting, and directing student activities during the university year. Emon is a polite, hard working, admirable, and dedicated student. The president of our University happened to be in the group – an intimidating presence to most undergraduates – but Emon handled himself with a polished confidence, attending to audience questions about meteorology in a friendly, clear, impassive manner. Without hesitation, I strongly recommend his internship with your organization. Please do give his your most thoughtful consideration.